I have clients (and colleagues, and friends, and family members…and myself at times) who are so afraid of messing up that they don’t do anything. Who are interested in learning a new skill or stepping up at work or going after their dream, but stop themselves before they move forward because they hate the thought of making a blunder or seeming like they don’t know what they’re doing. But doing nothing is worse than making a mistake by far. It keeps us stagnant and, at times, bored. It keeps us from learning and growing. It keeps us from connecting with other people and stretching beyond what we know. So what if you don’t know what you’re doing? What if you might make a fool of yourself, or try something and fail? How can we let that be okay when we’re driven to excel, to look like we know nearly everything, to always do our best? Allowing ourselves to make mistakes is the only way we can allow ourselves to try, learn, and do new things. It is more honorable and useful than doing nothing. But it takes Thoughtful preparation and patience, and often a sense of humor! Try something new. 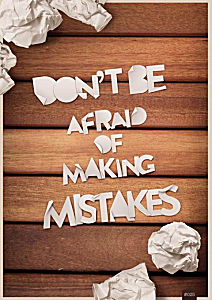 Make a mistake. Keep going. How do you let yourself make mistakes to learn? For support in making mistakes and being okay with that, contact Lisa at lkohn@chatsworthconsulting.com.